The Swiss Commission for Technology and Innovation (CTI) awards Geneva Biotech and Partner University of Geneva CHF 977k for development of an early stage drug discovery program in cellular signaling. This entry was posted in News on November 25, 2014 by admin. 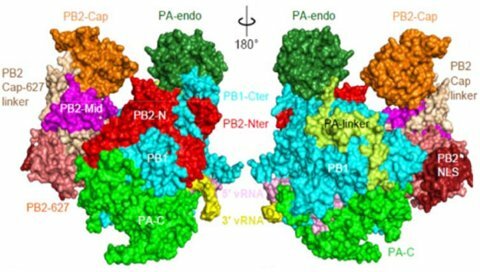 The influenza polymerase remained inaccessible for decades – the challenge to produce this highly complicated protein complex for detailed analysis, proved to be a seemingly insurmountable technical challenge. The break-through studies, lead by Stephen Cusack, renowned influenza expert and Head of the EMBL Grenoble Outstation, used Geneva Biotech’s ComplexLinkTM technology to produce recombinant influenza polymerase complex from a self-processing polyprotein, as recently published in Nature (2014, 516:361-366).